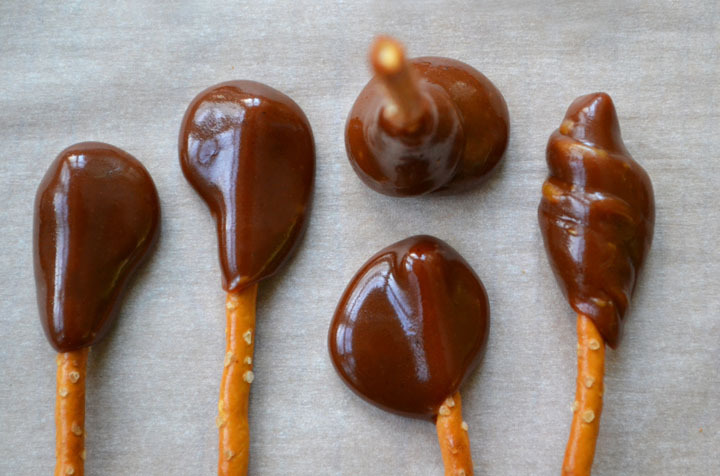 Makes: Makes about 100 caramel-dipped pretzels. 1In a large, heavy-bottomed saucepan, heat the syrup, sugar, salt and lemon juice over medium-high heat, stirring until the sugar dissolves completely and the mixture begins to simmer around the edges. At this point stop stirring – you can swirl the pan as the temperature rises. 2Cook uncovered, swirling the pan occasionally, until the mixture reaches 305°F on a candy thermometer. Meanwhile, warm the cream in a small saucepan. 3When the sugar mixture reaches 305°F, remove the pot from the heat and stir in the butter. Gradually stir in the hot cream; it will bubble up and steam, so be careful. It will clump up as some of the carmel solidifies – don’t worry about it. Return the pan to the heat and cook, stirring occasionally at the beginning and then more frequently at the end, for about 15 minutes, or until the mixture is smooth and reaches 260°F on the candy thermometer. 4Remove the pan from the heat and stir in the vanilla. Set it aside for 5 minutes or so, until it thickens to the texture of thick molasses. Dip each pretzel stick a third to halfway deep, swirling to catch drips and coat the end of each pretzel, then set on a parchment-lined baking sheet and let sit until cool. If the caramel thickens to the point where you can’t dip the pretzels anymore, warm it again over low heat. If you like, shape the soft caramel around the end of each pretzel when it cools enough to handle, but is still pliable.